I'm embarrassed to confess that our toy box would probably qualify for that Hoarders show too - none of our toys ever get tossed unless they are trashed! And even then they get kept if Boodie still plays with them (she is the master toy killer here). MOL..Harley, Is that the new trick to get the new toys ? We're off to check our toybox too!! Haha! 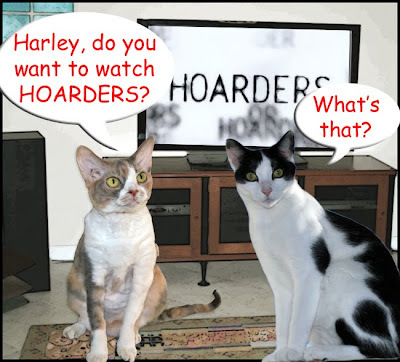 Are you a horder, Harley?? We kinda are too!! You two are so correct about hoarders. Ewwwww. Do you know that some people even hoard animals which is so very sad. We love the funnies. The pictures are great. Ya know, every time I watch that show I get the urge to clean out something. We live fairly lean on stuff compared to others, but it always scares me into thinking I have too much. Harley, I'm sure your toybox doesn't qualify! The publicist is a thrower-outer and the male person is a keeper-for-later. It makes for an interesting marriage. And for some loud discussions. Harley, anything you don't want you can donate to the shelter! Toss and clean the toy box out...that's a genius way to ensure you get more toys Harley!Mwahahaha. Our toy box could do with a clean owt too! Erm ... our toybox needs it's annual tidy up too. MOL! 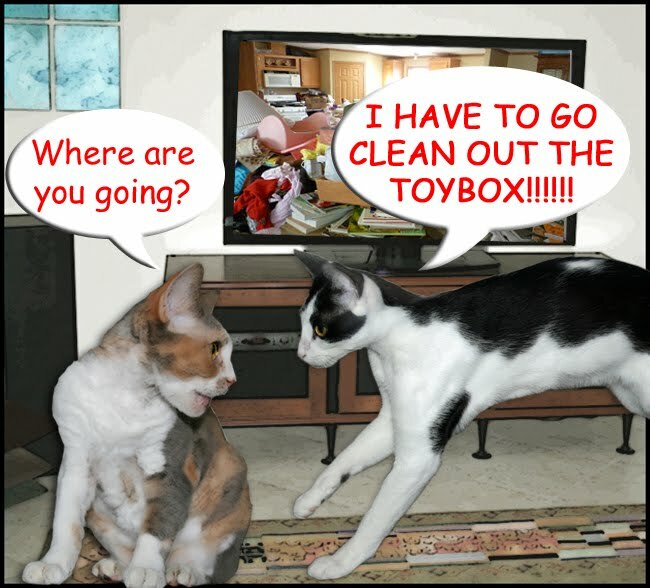 Harley, we think toyboxes would be exempt since each and every toy is very, very necessary! Mom is not a hoarder but she does have a lot of keepsakes. Harley has the best idea. Right after Angels party, we will clean out our toy box. THis was a cute post you guys! Mom cleaned out her sisters apartment when she passed away suddenly last December. Sister was a compulsive shopper and somewhat of ahoarder. There was nothing nasty, and most of the clothes still had tags and some were still in the shopping bags but it was a bad situation. There was stuff everywhere. Yep... that's one good thing about the show... It makes you want to clean everything. Harley, Whenever I watch hoarders I start cleaning everything too. 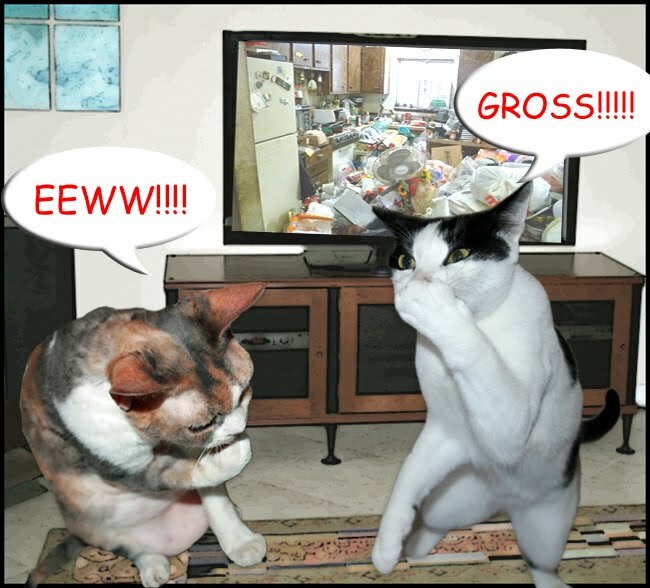 all can watch extreme couponers and stock up all lots and lots of catfood. Of course if yur lyk tha beans on tha show yall wuld buy dog fud and not hafe a pup. we hafe waaaay too many toys here too but sissys trying ta get us to wear owr toys owt and owt they go. 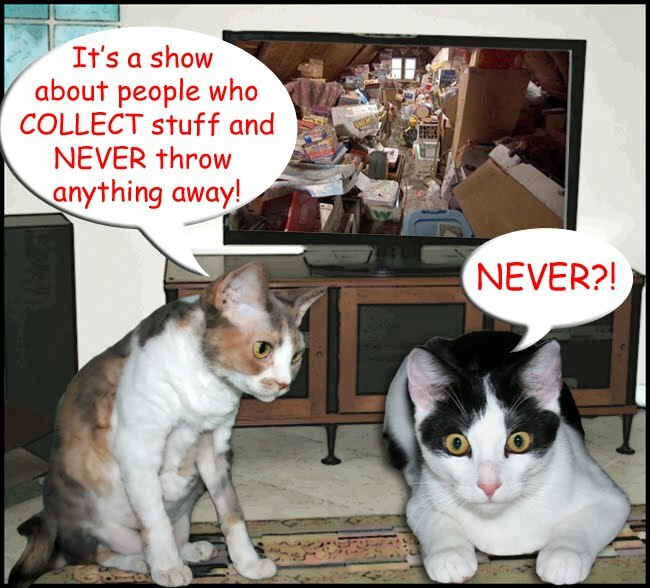 We only have basic cable so we did not know about the show, Hoarders. Wow!!! The humans here do tend to save stuff a lot, so I think it would be good for them to see that show. But they have been really organizing the basement, so I think they are safe for now to not be classified as Hoarders. Yikes Harley, you best be cleaning up the toy box for sure! LOL!! Daisy, stop Harley! Stop him from throwing all the toy away! I've never seen that show but sounds weird! You would scream if you saw our old toy basket! Mama ended up donating efurrything we didn't play wif and it was about 75 toys! Harley when the toy box is clean I am sure you will get a treat as Mom's love a clean room. Oh my!! We need to check out our toybox, too!! And ewwwww is so right!! MOL! Good job Harley, no hoarding! Ohhhh noooooo!! I think i better do the same! I am with you, Harley. That show is super scary! MOL Miles should watch that show!! I saw your "Monday Funnies" on a sidebar and had to come and see it up close. What a fun post! Thanks for thr giggle. it's ok, Harley. i'm a bit of a hoarder myself... as long as it doesnt get too out of hand it's ok! Uh oh! Mum says our toy box is stuffed rather full too.